Take a tour around the gallery of Sundaram Tagore in Hong Kong and Singapore and you’re likely to see a score of young Asian millennials — collectors in their own rights — snapping up pieces worth anywhere from $30,000 to $50,000 USD. “I don’t see any distinction between how much Asian and Western clients are willing to pay,” comments Tagore. But it’s not just sheer buying power. According to studies conducted by Nielsen, the “Asian American and Pacific Islanders” racial group is among the fastest growing — both within the country itself as well as globally. According to Mariko Carpenter, the VP of strategic community alliances at Nielsen, the “enormous” AAPI population growth is fuelled by both immigration and rising birthrates. The racial community has grown like clockwork to 43%. The result is that multicultural voices are appearing far more frequently and actually appealing to a cross-section of the consumer population. Multicultural influencers like Lilly Singh and Michelle Phan are able to easily speak to audiences, making them content creators with mainstream appel. Multicultural audiences are the ones that are actually setting the agenda of broader consumers content: For example, this group is 124% more likely to use Yelp, 92% more likely to read and contribute to blogs, and 51% more likely to read restaurant reviews, when compared to non-Hispanic whites. In other words, they’re the ones who are active on the platforms, making use of various digital tools and networking sites that other users gain from. So the market is growing, it’s powerful and it has global attention. But there’s one more reason why multicultural voices and audiences are so crucial to marketers: They primarily consume on video or imagery-based platforms like Instagram, YouTube, Vimeo and more. 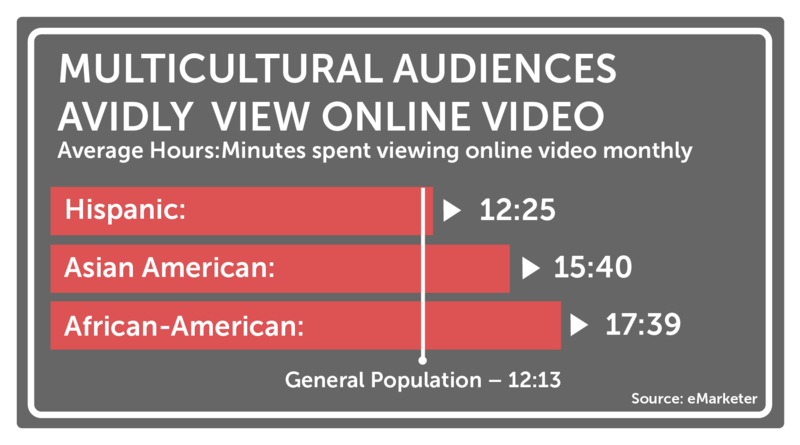 Multicultural audiences simply spend more time with digital video and on video-based platforms than “general” populations. Part of it is democratic. And part of it is technocratic. There is a great breaking of boundaries when it comes to cultural conversations, economic inflow, and prosperity as well as sheer reach through video. So here’s a trick question: If “Asian” buying power grew by 160% in the 13 years between 2000 and 2013, and is likewise expected to continue to grow to $950 billion in 2019, where is much of their disposable income likely to go? Answer: On content that is presented through video. While Caucasian Americans are “tapped out”, African Americans are tuned in: they’re more connected than the general U.S. population, spending more time with television, magazines, and radio. The rise of the influential “black Twitterverse” has become a major national and political “force”, providing commentary and context to even those beyond African American communities. 64% of ethnically “diverse” YouTube users are watching more videos in 2017; African-Americans spend about 44% more hours on online video monthly, and Asian Americans spend about 27% more hours. Black millennials want to feel a sense of personal connection to the content they’re consuming so they’ll turn to YouTube creators with more consistency than “traditional” celebrities. Digital video has also caught on with Hispanics. 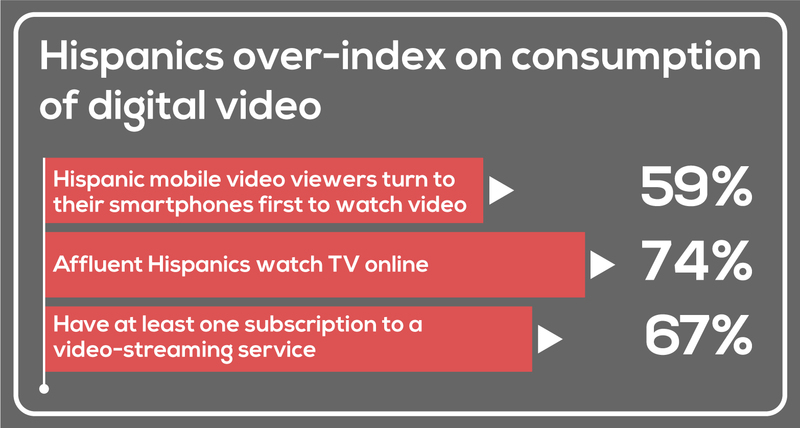 According to Nielsen, Hispanics over-index on the consumption of digital video, and 67% have at least one subscription to a video-streaming service. The average Hispanic consumer also spends over 26 hours a month streaming video online or on their smartphone, which is seven hours higher than the national average. 74% affluent Hispanics watch TV online and Hispanic Millennials are 55% more likely to watch TV online. If you’re looking for this audience, that’s where you’ll find them. More than any other online platform, mobile is where Hispanics watch and engage with online video. 59% of Hispanic mobile video viewers turn to their smartphones first to watch video and 53% are more likely to watch ads on their smartphones than the general population. And 50% of Hispanics say that they feel more “favorably” towards brands that incorporate aspects of Hispanic culture in their digital advertising campaigns. Video — film or digital — is that blend of mediums that allows the viewer to feel an instant sense of connection. Right from the outset, it pulls the audience in, weaving a story, making a point and giving them visual, aural and emotional experience. Case in point is many brands’ prolific use of video ads in reaching audiences in the APAC region. SE Asia’s dominance in Google’s latest leaderboards for YouTube ads, for example, can’t be missed: Seven out of the 10 top-ranked video ads came from Vietnam, Thailand and the Philippines. The bottom line is that while multicultural audiences and influences are considered a market “segment”, they’re no longer poised to remain merely a segment — rather, they’re poised to take over and lead the way in setting trends and being a brand’s most reliable and consistent consumer.